Wow, we have been so busy here at Urban we have really slacked with our blog! As a huge sorry we have so much content planned for you, not only from us but lots of amazing wedding suppliers. We will be bringing you the best Manchester weddings of this year, okay a few uber cool ones we just have to share from all over the UK! Besides this, we will be bringing you some wedding inspiration with styled shoots, hints and tips and of course our 2019 wedding trend predictions! And if that wasn’t enough we will bring you closer to your suppliers with our insider supplier stories, get to know them and their business, the highs and the lows and some juicy insider gossip! We know, We know, we are spoiling you, if you do not want to miss out and receive your weekly dose straight to your email then sign up for our newsletter now! 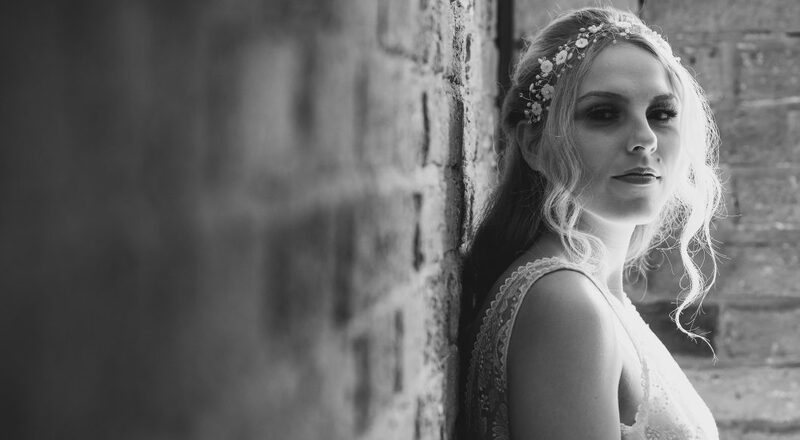 However, this week we thought we would share with you our latest boho industrial styled shoot. The venue was the trendy Lock 91 Bar & Lounge. A 19th-century lock keepers cottage in the heart of Manchester City Centre. We had a clear vision for this shoot and wanted to create a Boho wedding within an industrial setting. The two styles have lots of similarities and both focus on natural elements and textures so marry together beautifully. We also wanted to show that with the right building you absolutely can have a Boho wedding indoors. Well let’s face it, our great British weather won’t always allow an outdoor wedding. We love this venue, for its industrial characters and quirky features and laid back boho style. It’s not yet licenced for weddings but with so many amazing celebrants out there you can still marry here. We used the top room under the railway arch for the wedding ceremony. Zoey styled this with a gorgeous wooden and copper hexagon arch, supplied by her own company Bespoke events and styling. Lucy, from Little White Attic, added the most perfect Macramé. It was then finished with a stunning floral display from Perfect Bouquet Full of Flowers. We just love that Macramé is back with a bang! The way we have seen it so creatively used in boho weddings got us inspired, we just knew it had to be the focal point of our shoot. We used it throughout the styling and Lisa even used it in the cake design. Lucy supplied us with the most beautiful macrame pieces, she really does have an amazing talent. The venue has two outside terraces, and we made full use of the one on the ground floor. We set up two areas outside one was a cake area and the other was the wedding table. The cake area was scattered in bold colourful cushions. We had the macramé canopy hanging over the stunning cake provided by Urban Cakehouse. Lisa smashed the brief on the cake. She carried the colour palette through the cake and added a hexagon tier and a macramé detailing. The wedding table was full of colour, we chose a jewel colour palette with accents of copper. We want couples to not be afraid of using colour and to be bold with it! We added the colours through the candles, table runner and napkins. Kat, from Perfect Bouquet full of flower, carried them through in the gorgeous floral displays. These all complimented the copper and glass charger plates beautifully. The look was complete with the copper detail stationery from raspberry toast. Our beautiful model bride was Charlotte and she was pampered by Makeup by Lauren and her hair was styled by Eve Bower. The dresses were supplied by The Conscious Bride who has a stunning collection of ethically sourced wedding dresses. We teamed her looks with hair accessories supplied by Fancy Bowtique. We also had a gorgeous hand-painted leather jacket from Sammy Leas Retro. For us, shoots are about collaborating with other wedding suppliers and for us all to have the chance to be creative, show our skills and passion. The whole shoot was expertly photographed by Emma Boyle Photography. After meeting with Emma and showing her the mood board we knew she would be able to capture the shoot showing off the style and theme perfectly. Also having our very own planner Chelle who owns Michelle Amy Weddings on site pulling everything together and making sure we ran on time, we knew the shoot would be flawless.